One of the best compliments is when someone says, “You look wonderful. What have you been doing?” Had a little ‘work’ done? Lost a few pounds? New haircut? Eating paleo-vegan-dairy-free-gluten-free? No, you’ve been to Bluffton Lash Lounge; the new look of your beautiful eyes is a game-changer that’s getting you noticed. Active in the spa/personal care business for many years here in the Lowcountry, Locklair and James had worked together and were neighbors in Bluffton, when one evening over a glass of wine, Locklair suggested they go out on their own. James was a couple steps ahead of her, having already looked at commercial real estate possibilities. “The next thing you know, we had a long list of all the things we were going to need,” Locklair said. In addition to their lash extension treatments, Bluffton Lash Lounge also offers facial waxing, lash and eyebrow tinting, and threading. Professionally licensed in all areas of the services they provide, selecting the best products is a key component to the building of their dedicated following. Learning the mechanics of lash extension application earlier in their careers, Locklair and James selected NovaLash as the primary provider of lashes for their clients. A leader in semi-permanent, individual lash bonding, the partners trained with NovaLash and are licensed and certified technicians for this pioneering lash line. A great deal of research and care also went into the selection of their waxing product. “Our wax is soy-based,” Locklair said. “It doesn’t adhere to the skin as much as other waxes, and there’s just one temperature setting. It takes about one minute to heat up, and the whole container gets warm, instead of heating it from the bottom, which can burn the wax. 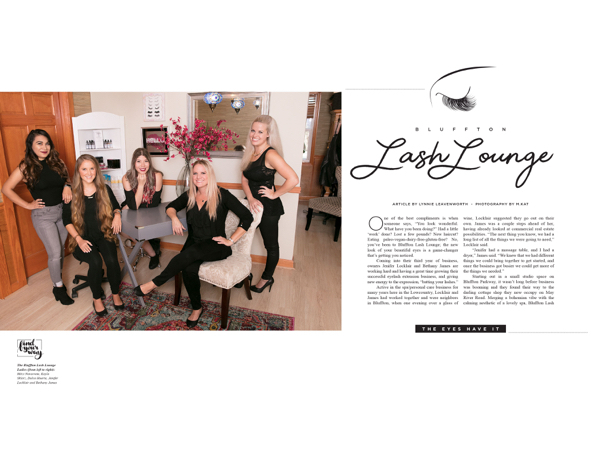 It gets warm all the way through, and it’s the perfect temperature.” The team has plans to add additional services to their waxing menu, and they encourage clients to let them know what they are looking for, because things are always evolving at Bluffton Lash Lounge. Bluffton Lash Lounge is located at 1253 May River Road, Cottage D, Bluffton. For more information, please call (843) 290-1192 or find and friend Bluffton Lash Lounge on Facebook.